While the nation revoked its patriotic sentiment watching the Republic Day celebrations in Delhi on TV or in person at the parade, some of our senior Delhites took a day out to celebrate the day like it should be. Singing patriotic songs, recollecting past Republic Day memories and chanting national slogans with their grandkids and making new friends. 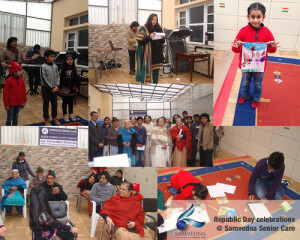 The Republic day celebration, at Samvedna Senior Care Centre, was a heartwarming experience for all of us. While most of our senior member confessed that it has been years since they last took part in a Republic Day celebration, others rejoiced in narrating stories from their past Republic Day celebrations, back in the day. Our members brought in their grand kids to take part in a drawing competition and a musical event along with a live musical troupe, which performed at the event. The members sang along chanting patriotic anthems and one of them shared his experience of how they celebrated the day back in the Army. A funny narrative of getting lost during a Republic day parade celebration by a member got all of us in splits. The day drew closure with refreshments shared at the end of the day and the members sharing their experiences of how much they enjoyed celebrating Republic Day with their grand kids and new friends after such a long time. All in all, we bonded over that one common feeling of patriotism, brotherhood and love for a country that strung across age barriers and boundaries of all kind, to result in a day that will now be etched in our memory lanes forever.